I’m looking for a picture…can you find it? Have you ever looked for a few pictures on your computer but couldn’t find them? You were remembering something about those pictures but couldn’t really find them. 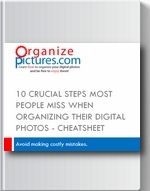 This has happened to me many times before I started to organize my pictures using a structured approach. After I started applying the method I’m describing on this page I never asked this question again. In this article I will outline the key factors that contributed to this success. This question was one of the key questions that drove me to create my own method for organizing my pictures. How would I be able to always find the pictures I want to find. For example: let’s say that I want to see the pictures I took last year when my daughter was born. I know I have them on my computer but where are they? And then I asked…where SHOULD they be? How should I name my folders so that I would be able to go straight to the pictures I wanted to see? With that in mind I started asking more questions. What makes me remember things and events? When I started thinking about this question I realized that I basically need three things: an approximate date (the more precise, the better), the place where the event happened and a brief (one or two words) of the event. So, in my case my mind would look for something like: August 2006, birth and hospital. Ok…these are the things that go through my mind when I’m looking for pictures of my daughter’s birth. It’s obvious then that I would want to name the folder using these three pieces. Consequently, if I would have a folder named Aug_2006_birth_hospital it would quickly indicate to me that it contains the pictures I was looking for. Great so far! But with so many pictures that I took of my daughter and other pictures around that date (baby shower, relatives and others) it would be pretty hard to put all of them in one folder and still be able to find what I was looking for. Hmmm…I need more structure. “Divide and Conquer” is needed here. The problem needs to be broken down into smaller pieces…much smaller. First let’s fix the date: August 2006 is not a good name for a folder. Why? It doesn’t sort automatically. I mean if you have folders called January 2006, February 2006 and August 2006 the operating system will sort them in an alphabetical order: August 2006, February 2006, January 2006. This is not helpful at all! Let’s fix that…name the folder 2006-08-11 that’s 2006-August-11. Numbers are automatically sorted by your computer’s operating system and that would help me a lot down the line. Secondly the place. Well…once the date is clearly marked, the place is nothing special. Just added it to the folder name. Most of the time if you just have the date and the place that’s all you need. So far we have: 06-08-11-hospital. Third would be the description of the event, in this case it would be birth. What we end up with is: 2006-08-11-hospital-birth. Now we have a simple but very descriptive and efficient folder name. This is what we’re looking for when building folder names. Thirdly, a short description. Adding a short description of the photos in this folder makes a big difference when you are visually scanning your folders on your hard drive. So, adding the word “birth” in the folder name in addition to the place: “hospital” makes the folder name very descriptive.